As anybody with a long enough memory will be able to tell you, watching children’s television throughout the 1970s and 1980s could be a peculiarly pick and mix affair. With limited budgets, programme planners had a tendency to show whatever they could pick up, and what came to be shown on our screens could be esoteric, to say the least. From the Eastern European animations that would occasionally pitch up in the middle of the afternoon on Channel Four to oddities such as Wattoo Wattoo, La Linea, or animated versions of the cartoons of Guillermo Mordillo, one could never quite be certain what might show up on our screens, particularly when filler material was required to fill a five minute gap in the schedules. Football’s particular entry into this field would have a short life, animation-wise, but would come to be a familiar face for several years after he disappeared from our television screens. 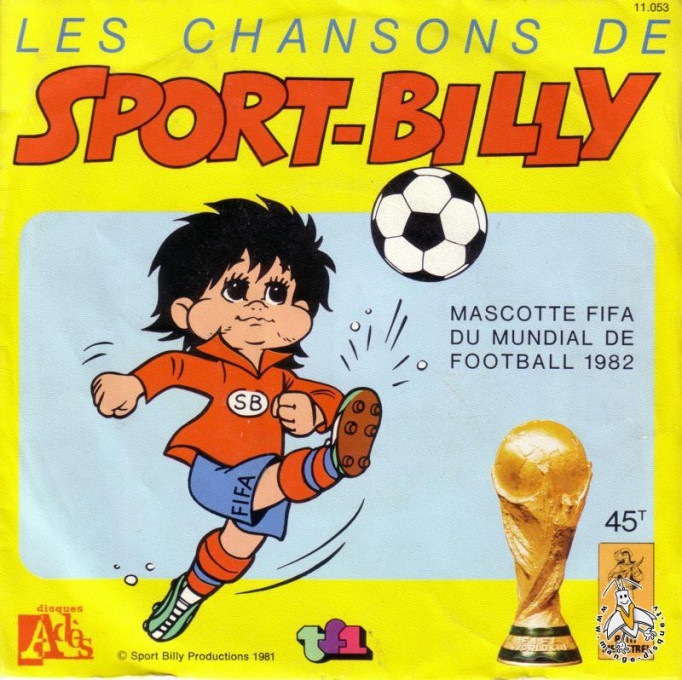 Sport Billy was already a cartoon character in continental Europe and South America when he was licensed to the American animation studio Filmation in order to try and capitalise on the growing popularity of the the game in the United States of America, where the success of the North American Soccer League was fuelling the – mistaken, for a few years – belief that association football was about to break through in this massive television market. Filmation had begun their life 1962 as a high volume producer of Saturday morning cartoons, specialising in acquiring the licenses to produce animated cartoon shows based on popular icons. After truly breaking through with series based upon Superman and Archie in the late 1960s, they became a familiar name on both sides of the Atlantic, they produced such tepid far as Fat Albert & The Cosby Kids, The New Adventures of Batman, and The Tom & Jerry Comedy Show. They were a natural fit for a Sport Billy series, which was initially produced for broadcast in West Germany but which was quickly dubbed into English, for broadcast in the USA and Britain. The series ran for twenty-six episodes and was shown in the USA on the NBC network, following in the UK on ITV on Saturday mornings in 1982. FIFA, meanwhile, had already adopted Sport Billy as a mascot for fair play. 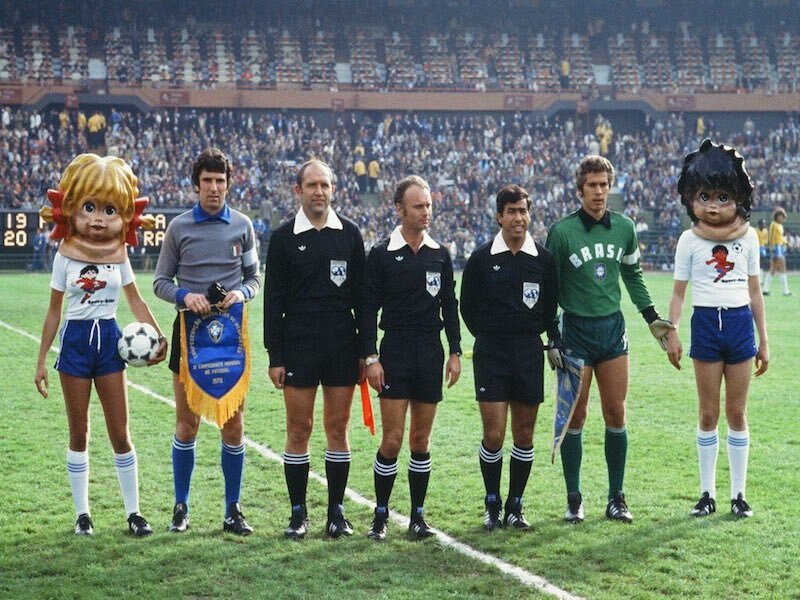 He’d made a tentative appearance at the 1978 World Cup finals in Argentina as a mascot for fair play (here he is, looking particularly creepy before the match at that tournament between Brazil and Italy), but with the television series in the pipeline, FIFA’s growing understanding of its own commercial potential and the nebulous concept of “fair play”, his profile became considerably higher four years later in Spain, with pitchside hoardings appearing during matches and various items of marketing tat being released, including an album of his songs. He shared the billing as mascot for the tournament with the very familiar Naranjito. He also turned up in a slightly more surprising place. FIFA had introduced its Fair Play Award for the 1970 finals in Mexico. Teams that qualified for the second round on are eligible for the prize, with the winners receiving a diploma, a fair play medal for each player and official, and football equipment to be used for youth development. For the 1970, 1974 and 1978 tournaments the winners of the award received a certificate, but for the 1982 finals FIFA introduced a trophy for the award in the shape of Sport Billy. This trophy would come to out-live almost any other iteration of the cartoon character, surviving the next two tournaments before being replaced with something altogether more serious looking for the 1994 World Cup finals in the USA. But what of Sport Billy the cartoon series, though? Well, the conceit of it all concerns a young boy named Sport Billy who is from the planet Olympus (a twin planet Earth on the opposite side of the Sun – who knew?) which is populated by athletic god-like beings. Billy has a magic size-changing bag called the Omni-Sack which, somehat conveniently, produces various tools as he needs them. He regularly travels to Earth in order to promote teamwork and sportsmanship, fighting a Pound Shop Cruella de Vil called Queen Vanda and her side-kick en route. Vanda’s mission, which presumably came to Joao Havelange in a dream after a particularly heavy night on the port, is to destroy all sport because she is so disgusted by the very concept of fairness. And… it’s not great, no. Filmation were always known for the quantity of shows that they produced rather than their quality, and the animation here is cheap and nasty, whilst almost the voice work is perplexing – Billy himself sounds approximately thirty-four years old – and all of the characters on display are just about guaranteed to annoy anybody over the age of ten. This, however, probably shouldn’t be considered too much of a criticism. After all, Sport Billy was never made for an audience of grumpy, middle-aged men seeking to relive their childhoods through the medium of watching old cartoons, was it? This particular episode is set in India and features a lacrosse match which would be… unlikely to be broadcast in the twenty-first century. Still, though, Sport Billy marks a significant point the history of international football. By the 1986 World Cup finals in Mexico, FIFA was starting to standardise and commercialise. Realising the commercial value of the finals was possibly the most significant thing that happened to FIFA over the course of the last half-century, and this realisation essentially led us to where we are today. In international terms, it was the birth of Modern Football. And that FIFA chose to market it through a cartoon series based on the concept of fair play speaks volumes about what the game’s governing body thinks of itself. The reality, as we’ve seen repeatedly over the last few decades, has often come to look very different to this indeed.